April, and the rains continue. The weather here is of constant interest, rain at the right time means life, too much rain, too little rain or rain at the wrong time could easily lead to loss of life. We are worried that it should be stopping now, but ‘hungry season’ is over, the maize grown on campus has been harvested and every now and then it comes to the hospital kitchen for us. We even had fresh beans and peanuts today! A few weeks ago we saw a 9-month old boy who I suspected had Down syndrome. I arranged for him to be seen by a paediatrician and he has been officially diagnosed. This led to me having a conversation with the manager of a rehab organization working with children with disabilities. We talked about the link between Down syndrome and hearing loss, which resulted in her sending us 8 children in one week! 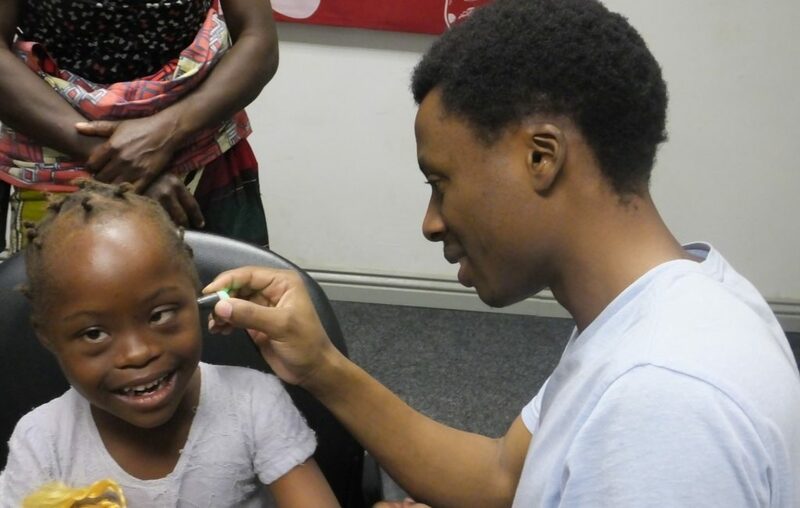 We identified a number with hearing loss, and it was excellent practice for the staff to see so many children with the same syndrome at one time. Next week one of the trainees will be presenting a monitoring protocol he is developing for people with Down syndrome, which we hope will be implemented by the end of the month. I am passionate about supporting people with learning disabilities, so developing this link with the Children of the Blessings Trust (an amazing organization) is very special to me. The newborn hearing screening pilot programme started in December is developing into quite a major project, with a number of babies requiring specialist testing. So far every baby we’ve tested appears to have middle ear effusion, leading to complicated testing, which isn’t helped by our extremely frequent power cuts. I’m finding it quite stressful at the moment, and have some reservations about how feasible it is to continue the project, but for now it goes on. I am responsible for covering the newborn screening at weekends, and one thing I like is the chance to roam the whole hospital site, looking for babies. I am becoming accustomed to seeing the hospital laundry (including surgical scrubs) spread out on the grass to dry. It is interesting too, to have glimpses into the culture surrounding birth which is so different from my own. Here a new mother will have a family member (the guardian) with her at all times. Guardians are provided with a bench or sometimes a mat to sleep on, and they often seem to be more actively involved in the care of the baby than the mother. The guardians appear to be responsible for providing food, I haven’t seen any evidence of the hospital providing food for patients. One time recently I went to get my lunch from the hospital kitchen. Lots of people were sitting outside under the tree and no-one was eating, but I was late so didn’t take much notice of this. I rushed into the kitchen all apologetic, only to hear that the food wasn’t ready yet. As I waited outside, an ambulance reversed up to the doors to the corridor next to the kitchen. I leaned against the wall watching, idly pondering on what happens here when a patient dies, given that we have no mortuary, then I realized I was about to find out. The people under the tree were relatives of a young woman who had just died. She was stretchered into the ambulance and then her mother was expected to travel in the back of the ambulance with the body to the central hospital which has a mortuary. It seems the culture surrounding death here is also different from my own! Our food was delayed out of respect for the family, the cooks (very reasonably) didn’t want to serve until the body had been removed. Travelling around Lilongwe is still something I enjoy. We were in a traffic jam recently and my eyes were drawn to a man selling shoes. He had 2 pairs of shoes for sale. Now, clearly you’re more likely to sell your wares if you display them on your head, so the man had a single shoe on his head, the other 3 in his hand, then every couple of minutes he switched them around. How can such a sales technique earn a living? Then there’s the man who stands at the side of the road holding up a single puppy for sale. He seems to be there all the time, clearly he has a supply of young puppies, but is there really such a demand? I guess there must be. Whenever you go out in the evening, you have to remember to put bugspray on your feet. Of course you do, no evening is complete without the scent of ‘l’eau d’afrique’, as a friend calls it. The water supply is now a lot better than it was when I arrived, but we still have to filter our drinking water. It’s hot here, we drink a lot. I spend a lot of time setting up water to filter (with the world’s slowest filter system), storing it and filtering more. It probably takes about an hour a day, but I’m quite adept now at keeping the system going while doing other things. Our shower is out of action, it has been for some months. Fortunately I have kind neighbours who allow me to use theirs. In return I keep their water tank system running smoothly (which works in my favour too, otherwise they’d run out of water for my shower!). Today at the clinic we had a power cut and the back-up generator failed, so we ended up seeing a dizzy patient in the waiting room. A child came in needing attention, so he was seen in our tech room (that being the only other room available with any kind of natural light). Then we had an important guest of the college come in, disturbing my consultation again, and also requiring a guided tour. Fortunately otoscopes come in handy as torches! Showing around a distinguished guest in the dark is run-of-the-mill to us now. Patients generally seem remarkably unperturbed when the power goes out. Can you imagine a small child in England, in a room with no windows, when there’s a sudden and total black-out? I’ve not seen one child here even remotely upset by it. All in all I continue to be fascinated by the work here, with the endless challenges of complex patients, limited testing facilities and an appointment system that’s only about 50% functional because many patients have no way of knowing what time it is. I leave you with a photo of ‘Faith’*, one of the children seen recently in our dedicated clinic for children with Down syndrome. She loved our toys, and even more she loved having her photo taken!